River Dancer, now Odin, was adopted by Larry, Linda, and Cosmo of Anderson. 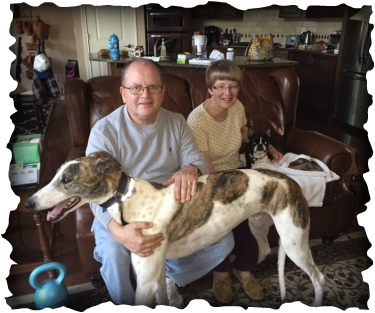 Linda has always been a lover and advocate for animals, especially Boston Terriers, but when her son adopted a greyhound she fell in love with this breed too. As soon as Larry walked out to meet Odin, he was immediately greeted with tons of kisses from this big boy. Odin knew this was his forever family. Cosmo gave Odin a couple sniffs and didn't seem to mind having him around at all. This pup will be very spoiled and we hope to see him out at plenty of events!